I find mini ecosystems to be a fascinating to create and study. Until reading this article, I hadn't thought about making multiple varieties of ecosystems for comparison. I also appreciate how the author tied in modeling from NGSS as a tool for adapting this lesson series to K-2. I plan on making these for my 2nd graders this next school year! I look forward to their models and observations! This article provides a lesson plan in which students create a mini ecosystem in a jar and observe it inside the classroom. I think this is such a cool idea and something that I could definitely see myself using in a classroom. I think kids would be excited about an activity like this. This article opens with a sentiment that caught my heart and brain: “Science is a human endeavor to better understand the world in which we live.” The author goes on to give very detailed and structured instructions—in 5E steps—for creating various types of ecosystems in jars with students. He describes aquatic and terrestrial jars, complete with guiding questions and extensions. This is a very valuable resource for anybody in an interactive science classroom. Students create their own ecosystems in a jar and observe and record changes in the system over two weeks. Through this activity student are then able to define what an ecosystem is and begin to understand that ecosystems are constantly changing. This article provides a hands-on activity that can be used to make observations. Most of the steps of a 5E model are present. The adaptation for lower as well as upper elementary grade learning is also provided. This lesson gives instructions on how to create an ecosystem in a jar and then gives tips on how to use them in a meaningful way in the classroom. 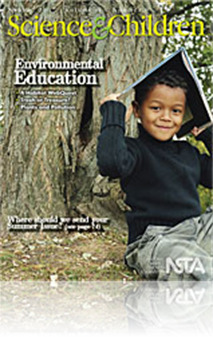 The article suggests giving time for students to explore the ecosystem and let their own observations be the guide for further questions and investigations, which is supportive of doing inquiry in the classroom. I also like how there are instructions to compare and contrast the student's ecosystems to ecosystems outdoors. I think this will help teachers to identify misconceptions that develop from using this model.